I have wanted to visit Lhasa, Tibet for as long as I can remember. Knowing how close we are here in Shanghai, and that you can take a train across the permafrost to get there makes me crazy with anticipation and longing. But knowing we have a son with congenital heart disease whose cardiologist has not signed off on Ben making the trek to such a high elevation means we've not yet gone. Regardless, I'm drawn to it. 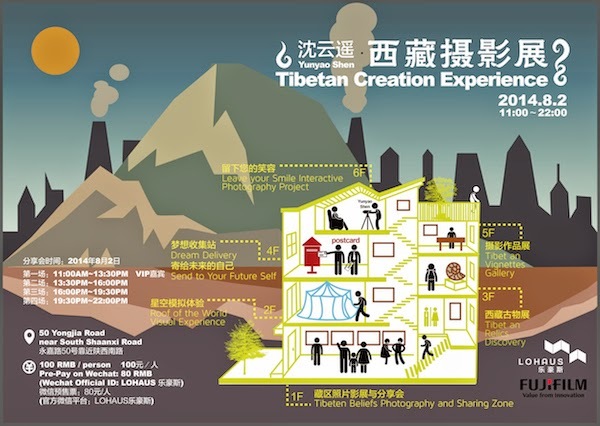 Last week on the Time Out Shanghai website I saw a contest for tickets to an art exhibition of photos of Tibet. With nothing to lose, I put my name in the hat and won! Michael and I headed across the river to LOHAUS, a six-story building built in the 1930's. It's a creative space for events and coworking. Why write that novel in a coffee shop when you can do it in an historic building next to other creatives working on their own artistic endeavors? On Saturday LOHAUS was hosting photographer Yunyao Shen, a 25 year old man from Shanghai with quite a story. It begins, as many stories do, with a girl. She wowed him on first sight, and suggested he get a digital camera to take photos of her. He thought things were going well, but she then asked if he had a house, which he did not. Sadly, she left him for a man who did have a house. His heart crushed, Shen approached the girl's father, who suggested he go to Tibet and practice his photography there (to get him out of the picture perhaps?). He did, and fell in love. Not with another girl, but with the place. He took lots of photos and gained popularity, eventually taking pics of Tibet for National Geographic. I love his story, for it was through following his heart (trying to get the girl's attention and affection) he found his dream, his passion. Even more amazing, Shen has a heart issue, and recently had a heart surgery which was deemed a failure as it didn't fix the issue. I got a chance to speak to him about it, telling him how my son's cardiologist won't let him go to Tibet. He said he carries his medication with him at all times, and had a scary moment on a recent trip there when his small group camped out overnight and was being chased by wolves (or possibly a leopard, his English was good, but some things got a little lost in translation). Everyone had to run to get to a safe place, and he said he thought for certain he was going to die because his heart was beating so fiercely and painfully. Yikes! He agreed it is not good for him to go there, but he cannot stay away. We were VIP's, treated to the first session of the day where Shen spoke about his work. In the photo above where he's speaking, you can see the photo he took of the ex-girlfriend who started him on this journey. She is wearing a Tibetan robe, standing in a grass field, her back to the camera. The exhibit was on all the floors of the LOHAUS building, with a different theme on each floor. On one floor we got to sample some Tibetan snacks. Everything was dried and preserved. I had a drink of some milk tea instead of the Chilean wine they offered and I really regretted it. I'm not a huge fan of tea or of dairy products, so who knows why I decided to take a big swig of a combo of both? Ugh. Another floor was set up to evoke the feeling of the Tibetan sky, with prayer flags going up to the ceiling, and some of Shen's photos of the night sky on the walls. On another floor, there were postcards of all of the photographs in the exhibit. Everyone got to take one and write their own dream on it, along with our mailing address. The next time Shen is in Tibet, he will post them to us. I chose the photo of the Potala Palace, former home of the Dalai Lama prior to 1959, and Michael chose the photo of the ex-girlfriend. I won't share with you my dream, and I haven't asked Michael what his was. It kind of felt like making a wish on a birthday candle. Where we left our dreams, to be mailed back to us from Tibet. On the sixth floor we got to sit for Shen to take our photos, as well as talk to him a little bit. We got to check out his camera as well. The photos he took of the guests will go into a future project. The details were hazy. In the photo below, you can see him down on the ground. The man on the couch had also been to Tibet, and he too has a heart condition. He said his doctor let him go because he could control the condition through medicine taken throughout the day. Sadly, Benjamin has congenital heart disease, a defect of the heart rather than a condition which can be treated with medication. His heart, at sea level, is already working much harder than my heart or yours, so it would put him at serious risk to take him to a place where it would be forced to work even harder. 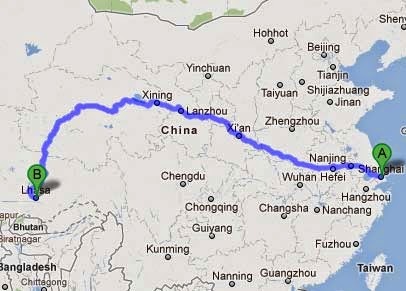 Maybe I can convince the grandparents to come stay here in Shanghai with Ben so Michael and I can go to Tibet? Please? Yeah, I totally took my photo with the photographer. I feel so short. The LOHAUS building has a tiny rooftop overlooking the city atop the sixth floor. I loved this view, down into a courtyard showing the nearby roof with bricks and metal to hold down the waterproofing. Over in Pudong on my side of the river everything tends to be much more slick and sleek and new. There's only so much you can do with buildings built in the 1930's when they start aging and leaking without simply tearing them down. We make the trek back downstairs to the ground floor. This photo was taken looking straight up to the rooftop skylight. It was a gorgeous exhibition in an amazing creative space. I feel so fortunate to have won tickets to experience it. As we left, our VIP status earned us some swag, and we got a couple of books, including one of Yunyao Shen's photographs featured in the exhibition, and some goodies from Fujifilm, a sponsor. And we were all given a bracelet from Tibet, the multi-colored braid highest on my arm (look how well it goes with what I was already wearing!). This especially excited me, as my love for bracelets is documented here, and it's so nice to have some tangible thing from a place I dream of visiting. After a day of discussing dreams, I am ever hopeful that this is one of my dreams that will indeed come true.